We are a leading Manufacturer of metallic label stock, chromo label stock, matt label stock, kraft label stock, fluorescent label stock and maplitho label stock from Delhi, India. 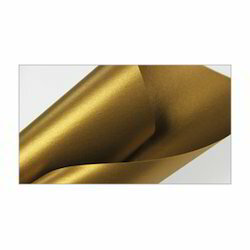 These are shiny metal finish self adhesive papers having metal foil like properties. The face is made up of a metallic foil permanently laminated on top of the paper. They are made from raw material purchased from certified vendors and are always in high demand because of their valuable qualities like attractive appearance, temperature resistance and flexibility We have variety of sizes in hues of silver and gold to fulfill the needs of our customers. The material ia available in both Glossy and Matte Finish. Our company is the noteworthy names engaged in manufacturing & supplying an outstanding range of Chromo Label Stock. Our labels have an opaque surface. One of their sides is brushed with chrome to give it a glossy and smooth finish. These products are made in compliance with industrial norms and guidelines by using advanced label making machines. They are one of the most widely used face stocks. Clients can avail them from us in customized specifications and sizes. These Matt Label Stock are low-gloss, glare-free papers. Their surface has a dull natural finish and they are widely used in printing processes where quick drying is essential. Our specialized teams work in close co-ordination with each other to help us manufacture and supply premium-grade Kraft Label Stock. It is manufactured at our state of the art infrastructure facility using recycled paper and is highly acclaimed for its eco-friendliness. 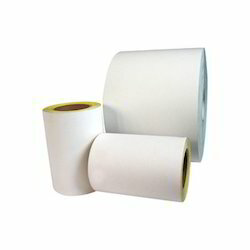 This paper is widely used by the printing, advertising and PR industries for versatile uses. They are available in different sizes to the clients at affordable costs. The Kraft Paper manufactured by us is also exported to our overseas clients in efficient packaging through various shipment modes. We are reckoned leading manufacturer and supplier of a comprehensive assortment of Fluorescent Label Stock that finds application for promotional purposes and other client specific uses. Offered labels are available in various attractive colors including lemon yellow, green, golden yellow, chrome, orange, red, pink and many more. 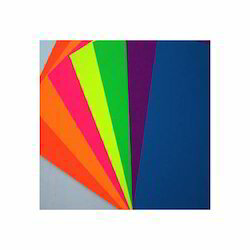 Fluorescent paper is an eye catching colored paper which is suitable for a wide range of printing and copying applications. These labels are manufactured from the quality material & label making machines as per the market norms. These are uncoated paper with rough surface finish. They are widely used for industrial and commercial labeling purposes, for example–pharmaceutical, inventory and shipping labels all use maplitho face stock. These labels are best suited for cases where printing on the label is done by high speed Laser and ink jet printers. Backed by the team of skilled professionals, we are manufacturing and supplying a wide assortment of PVC Label Stock that is highly durable, water resistant, very tough and flexible. 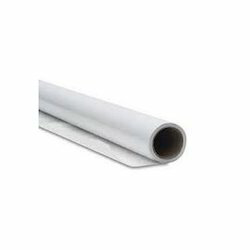 Our provided label stocks are made up of polyvinyl chloride (PVC) and have similar properties with ones having vinyl as their primary material. 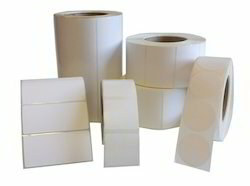 We have two major types of polyvinyl chloride labels namely Transparent and Opaque (Milky). Our organization is enthusiastically engaged in offering our clients the best range of Vinyl Label Stock. 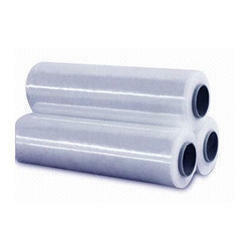 These are widely used for tough surfaces such as batteries, oil cans etc. Another major advantage these have is that they are water proof which makes them much more durable. We have vinyl labels with Matt finish and all our products are manufactured in strict compliance with the industrial rules and regulations. These vinyl label stock are made up of special type of plastics namely vinyl. They offer a variety of advantages of such as greater strength, transparency, flexibility and toughness.